Summary: Oil painting showing two young women in a bedroom. One of the women is crying whilst the other is comforting her. At the upset girl's feet is a letter and some flowers. Description: Having introduced figures into his work, Hardy developed his style further. The backgrounds of his paintings were brown, soft and dark and the foreground featured prominently lit figures. Sorrowful News is a good example of how his methods developed. 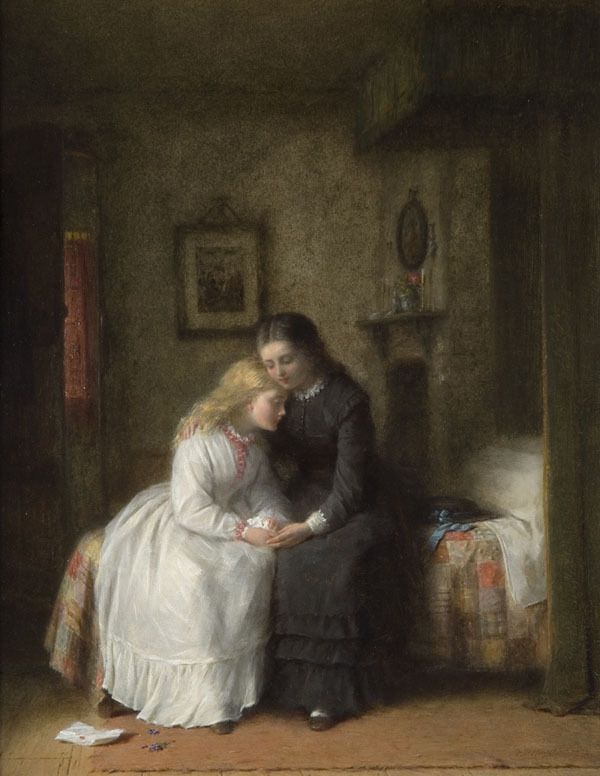 The recently bereaved girls provoke an emotional response in the viewer and dramatic incidents like this began to feature more regularly in Hardy's work through the 1870s. Description: Hardy's penchant for the domestic life is shown in this work. Here he depicts a more serious side of life - dealing with death.The picture featuress two young women in a bedroom. It is unclear how old they are. They could be sisters or mother and daughter.One of the women is crying while the other is comforting her. 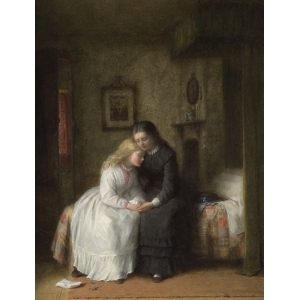 The young woman who is comforting the other has already changed into mourning clothes. The distressed girl, who has been out, has just come home and told of the contents of the letter. At the upset girl's feet is the received letter. Beside the letter are cut flowers that the young girl has collected from her walk. She has dropped them in her shock. They allude to the content of the letter by symbolising the shortness of life and impending death.